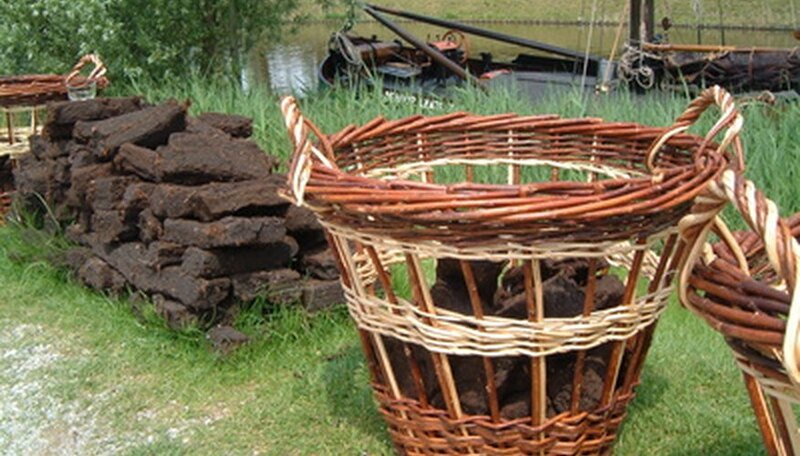 Peat moss, or sphagnum moss, retains moisture needed for plants and aerates heavy clay and sand soils. It also enhances composting capabilities, controls odor and protects the soil from becoming hard and impacted. Using peat moss in your garden and lawn isn't a difficult or time-consuming process and will enhance the life and appearance of your grass and plants. Prepare your lawn by breaking apart the surface of the ground with a garden hoe. Dig approximately 3 inches beneath the surface. Break up peat moss with a shovel before adding to soil. Peat moss crumbles easily. Use the shovel to scatter the peat moss over the entire surface of the freshly turned lawn. Do not attempt to scatter from the bag, as it is heavy and you could injure yourself. Only use about half of the bag of peat moss. Scatter organic fertilizer over the surface of the lawn area. Drag the rake through the scattered fertilizer and peat moss, pushing down firmly into the ground as you drag it. Drag from one end of the lawn area to the other end, to create row after row of burrows. Scatter the bag of grass seed over the entire surface of the lawn area. Shovel the remaining peat moss from the bag on top of the scattered grass seed. Water the lawn area liberally with a water hose that has a spray nozzle attachment. Administer approximately 10 - 15 gallons worth of water over the entire surface of the lawn area. Maintain the area by watering it weekly with 10 to 15 gallons of water. If living in an especially dry climate such as Arizona or Nevada, give the lawn area a daily watering with a sprinkler for about an hour a day. Grass seed, optional variety, approximately 40 lbs.